where is a constant, and , , , are the (real) values of that correspond to the vertices of the polygon (Milne-Thompson 2011). It is often convenient to take the point in the -plane that corresponds to one of the vertices of the polygon--say, that given by --to be at infinity. In this case, the factor in Equation (6.79) becomes effectively constant, and can be absorbed into a new constant of proportionality, . 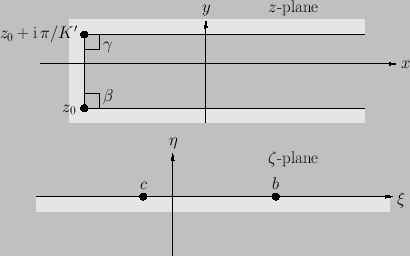 Figure: Conformal transformation of a semi-infinite strip in the -plane into the upper half of the -plane. and is illustrated in Figure 6.13. Figure: Stream function due to a line source located in the left-hand corner of a semi-infinite strip bounded by rigid planes at , , and . This transformation maps the point to the point , the -axis to the two lines and , and the upper half of the -plane to the region between the lines and , as illustrated in Figure 6.14. It is clear that the transformation (6.60), studied in the preceding section, is just a special case of the transformation (6.88). 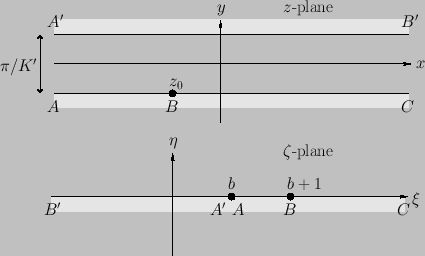 Figure: Conformal transformation of an infinite strip in the -plane into the upper half of the -plane.